Continuing the Aman Group’s successful foray into Japan following the 2014 opening of the Aman Tokyo, the hotel collective has launched a second property in the country, Amanemu. 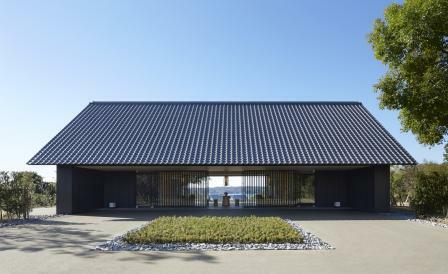 Located 300km southwest of the capital in Ise Shima National Park on the Kii Peninsula, the hot spring resort offers just 24 suites and four two-bedroom villas, and successfully replicates the ryokan experience — from the traditional okami, (female manager) right down to the private onsen featured in each accommodation. Designed by long-term Aman collaborators, Kerry Hill Architects, each room is sheathed in an ombre of pale Japanese timber, and features art by the likes of Japanese kimono and obi artisan, Genbei Yamaguchi, alongside custom-made coffee tables, sofas and neutral armchairs that are keeping with Aman’s signature reductive aesthetic. This theme is sustained in the bathrooms, where traditional Japanese baths and charcoal-coloured basalt stone tiles harmonise with the resort’s overall minimal aesthetic. At the in-house restaurant, izakaya-style cuisine is served under a vaulted and coffered ceiling from a menu that takes full advantage of the location’s riches, with lobster, sea urchin and abalone featuring heavily alongside a large selection of sake, shochu and vintage Japanese whiskey. It can all be sweated out at the Aman Spa, where salt-infused and mineral–rich spring water is pumped into two onsen pavilions and a watsu pool, and is utilised in treatments that aim to reconnect mind and body.